Blurb Deeta Richards has never seen the outside world. Before she was born a banking crisis brought civilization to an end and now no one leaves the safety of the compounds unless they need to, but Deeta still dreams of seeing more than the building she was born in. 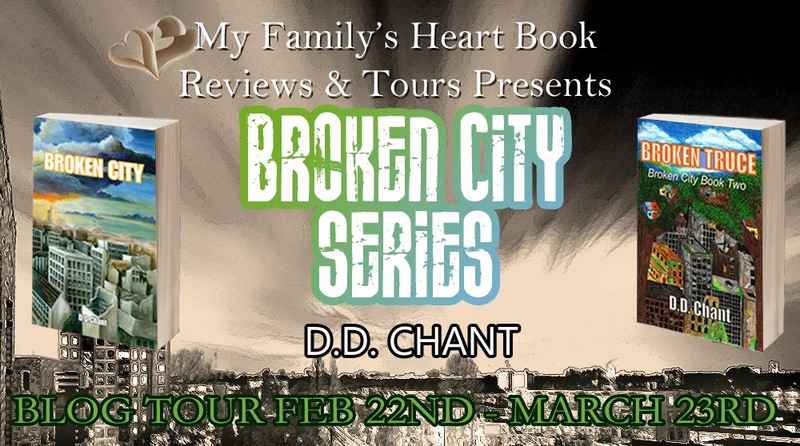 Review Broken City is the first Post-Apocalyptic/Dystopian book that I've read, and I just loved it! The world that D. D. created was so original. I can actually picture the compounds, even the empty buildings in The City. Though I don't believe it is ever specified WHICH city it is. I kinda like that though, it lets the reader can imagine it as a city local to them, wherever in the world they may be. At least until they have to look up a word and they realize that the author is from England. There were a few times that I had to look words up, because they were English terms that I had never even heard before. Does definitely explain why they drink so much tea in this book. As for Broken Truce, I'm loving it so far, I almost cried when something happened, so this one may actually be a 5 star by the time I've finished it. Of course, I can't specify what it is that happened, that would be a total spoiler, but I will definitely be picking it back up as soon as I hit publish! I only put it down last night, cuz I HAD to get some sleep. I'm about half way done now, and I will probably post a full review in a few days when I have a minute between reads, I can't wait to see how this one event is resolved! By the way...I LOVE some of the song choices in the playlist and soundtrack below! Also below is an excerpt with one of my favorite parts of the first book, and an excerpt of a great part that I'm reading for the first time! Blurb Life isn’t turning out the way Deeta thought it would. With the Lewises defeated and peace between the tribes, she’d believed that the dark times were in the past. Bio Hi everyone! 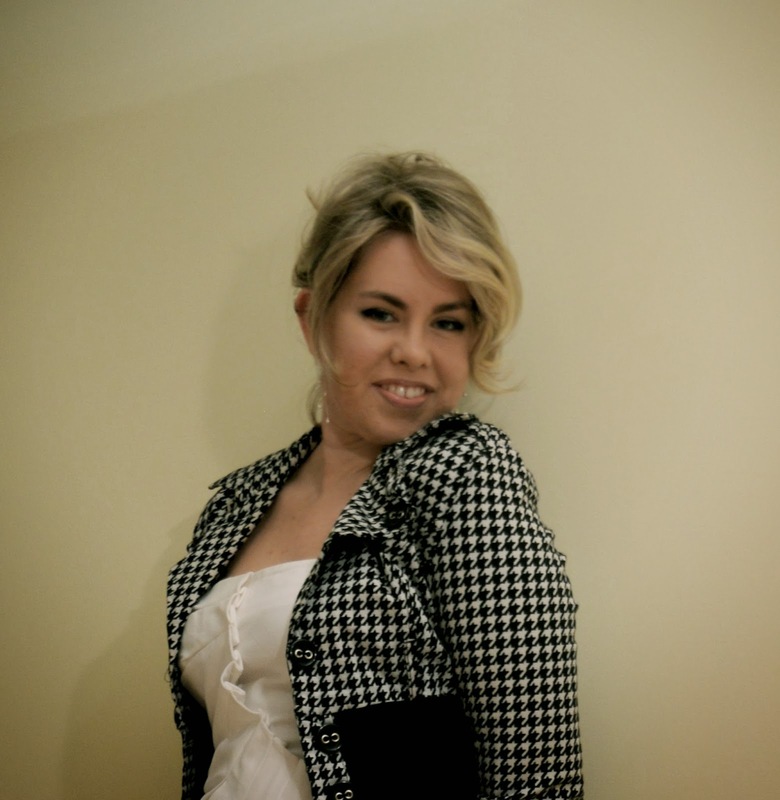 My name is Dee Dee, I’m twenty six and I live in a beautiful part of Devon, England with my family. I have a younger sister, Amy who is a brilliant guitar player, some chickens, ducks, geese, pheasants, a cat (that adopted us when we moved in!!!) and some Koi. 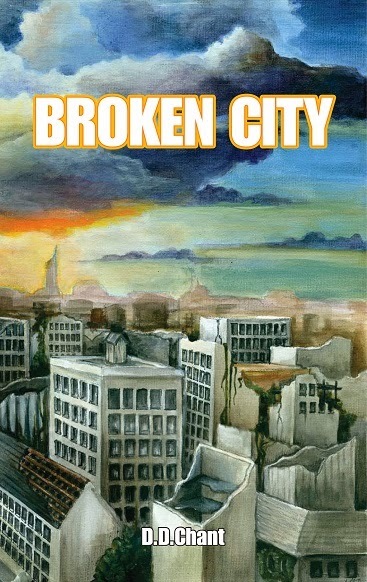 Broken City is actually my second novel. My first, as my Aunt so delicately put it, was crazy. In my defence I was only sixteen when I wrote it. On the plus side I learnt a lot (or so I hope) and two years later ‘Broken City’ was finished. 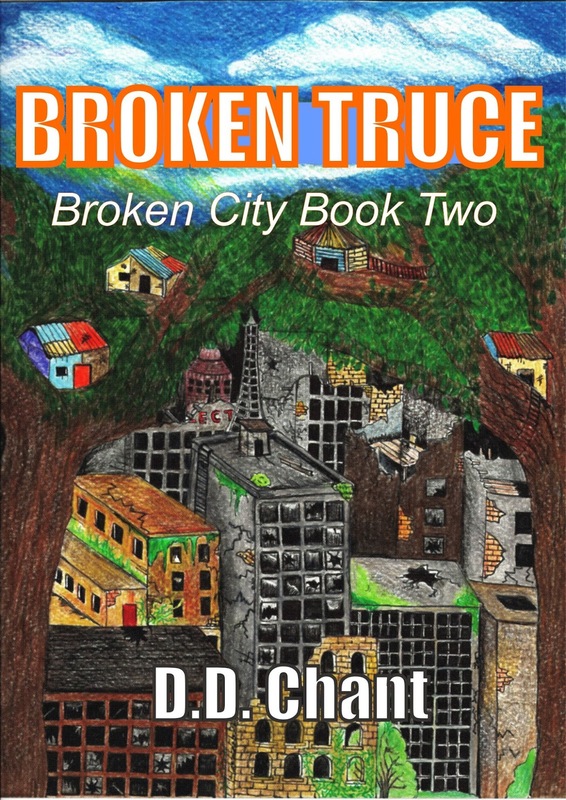 Due to the support I have received from readers I have just finished the next book in the Broken City series, Broken Truce! I have another book, ‘The Promise’, which is set in Saxon England is the beginning of a series. I’ve just begun to edit the next book and I’m really looking forward to releasing it. My third series is called The Chronicles of Discord. The first book, 'Fracture', is set in the distant future and tells the story of Astra, a young woman with a very big secret. I have just finished the second book in the series and it’s currently awaiting editing. D. D. Chant shares her personal playlist that you listen to while writing All of Adele's songs!!! 9. A-ha - The Sun Always Shines On T.V. I’m not sure how it happens, but the next thing I’m aware of is the faintly groggy feeling you get when you’ve been woken from sleep quickly. A glance at the clock tells me that forty minutes have gone by, yet the room is still silent, with no noise to rouse me from what had obviously been a deep sleep. I stand up and meet my own eyes in the mirror above the fire place. I’m staring at myself in a dazed kind of way, when I realise that mine is not the only figure reflected in its polished surface. I suppose it must have been the second time he walked through this room and the first time he didn’t notice me curled up in the depths of the large arm chair. He seems quite as shocked as I am to find he’s not alone. A full second elapses before I utter a strangled scream and leg it through the door and into the passage way. The first thing I come across is another camouflaged figure and my panic ratchets up a notch. I think of the children, who in about fifteen minute’s time, will joyfully be free of the shackles of their lessons. The two soldiers are behind me, so only way to go is up the stairs. The knowledge that I am leading the intruders towards the children, rings in my head. With the sound of pursuit hideously loud in the stairwell, coherent thought is proving difficult. I’m half way up the forth flight when I hear Dec’s jubilant voice proclaiming himself the winner of some unseen race. “Dec, run!” My voice cracks and my throat, already sore, tightens. Dec’s voice exclaiming above my head is cut short as he sees my pursuers. I hear the door onto the stairwell open and close above me and a moment later something hit the floor behind me with a dull thud. A cheer reverberates around the walls. Dec, bless him, hadn’t run away when I told him to, instead he’d brought a large book from the school room above and hurled it at one of my attackers. As that soldier was at this very moment out cold on the steps, I guess his aim must have been pretty accurate. The last of the men is felled by some sort of encyclopaedia, this time lobbed by Roydon. I reach the landing they are standing on, completely out of breath. Roydon and Dec seize a hand each and drag me after Ricky who is holding Tarri in his arms and has Carris’s hand tucked in his. From the direction in which they are going, I think their destination is Ralph’s house. But we keep running into the strangers that have breached the building and our efforts bring us almost full circle. We come to a standstill in one of the rooms with a connecting door and pause breathlessly. “Who are they?” whispers Roydon. Ricky steps back a little from the door and we all wait expectantly. Sure enough it begins to open, Ricky waits until it is almost half way before he kicks it shut with all his might. We turn and run though the connecting door in to the room on the other side and out on to the corridor beyond. We are tantalisingly close to Ralph’s house. How it happens I hardly know, but as Dec passes the open door of the school room, he is dragged kicking and screaming through the door by unseen hands. I scream and pull as hard as I can on the handle, but it won’t move. I realise they must have locked it behind them. Ralph’s door is just a little further on and I grab Ricky’s arm. I don’t know what he had been going to say, but he stops abruptly and nods. As I turn and run down the hallway I hear them banging on the Clark's door. There is no sign of Dec when I enter the school room, but from the knocked over chairs it is obvious that there has been some struggling. I run through the next two rooms desperately and hear, in the distance, Dec’s voice raised in protest. I burst into the corridor to find him struggling madly with one of the camouflaged soldiers. Picking up a stool from the room I have just come through, I use it to hit the man around the head. He sinks to the floor moaning and I taking Dec’s hand. We run down the passage, around the corner and up the steps, slap bang into more of the soldiers. Instinctively I push Dec behind me, below their visors I see derision in the soldier’s faces and when they step forwards, they pull us apart easily. Trying to tear away from the vice like grip on my arm, I pull my knee up into the soldier’s stomach. His smirk changes quickly to a snarl of pain and my struggles become more desperate. I manage to free an arm long enough to punch him in the face. I must admit to a feeling of gratification as blood begins to trickle from his nose. There is blinding pain as his fist connects with my face, slapping it sharply sideways and causing me to lurch backwards. I fall to the floor and it’s only Dec screaming my name that brings me groggily to my feet. I am rewarded by a merciless grip on my arm, forcing it behind me and well up my back as the soldier drives me heavily into the wall. I slip to the floor weakly, again hearing Dec’s voice calling to me. The sound grows gradually fainter, until my eyes close and I hear nothing. Broken Truce (Broken City, #2) The keys jangle in the lock and the soldier pulls the door open, his grin displaying gaps where his two front teeth should have been. Tom doesn’t answer him but walks past him and in to the room beyond. Presented with Tom’s back the soldier seems to lose what little sense he has, he launches himself at Tom. Tom twists away from him, catching his collar as he passes and ramming him in to the opposite wall. A dull crack fills the room as the soldier’s head connects with stone work, he collapses, sinking to his knees and groaning. With a sharp expletive, the second soldier comes at Tom slowly, very cautiously. They circle each other measuringly, looking for weaknesses, for any opening. This soldier is younger than the first, not so beefy, but still strong. He holds back, studying Tom even as Tom studies him. He’s better trained, Tom realises, not the mindless thug that usually passed for a Lewis soldier. This man had been taught caution, to think three moves ahead of his opponent. This man was dangerous, but he used his brain, so maybe there was a chance that he could be reasoned with. His left hand falls to his waist and he pulls free a six inch long blade. One edge is curved down into a point, the other carved into jagged notches that gleam in the artificial light. Tom’s face loses all expression, his hands curl into fists and he raises them slightly. Tom’s eyes never waver from the face, filled with fury, before him. The soldier laughs, an angry, mocking sound. Before the soldier can say another word, Tom’s fist crashes into his mouth silencing him abruptly. He staggers back, eyes dilated in shock. With a quick thrust, the soldier slashes his knife through the air. Tom jerks back and pivots, catching hold of his knife arm. They sway together dangerously, crashing into chairs and the table. It isn’t a pretty fight, there’s no time to do anything but react, and more than once Tom finds himself deflecting the blade at the last possible second. They struggle together a little longer, beginning to pant as their exertion slows them down a little. Tom reflects grimly that if he wasn’t being so careful about hurting the guy, he would have finished him already. He couldn’t cause the brute too much damage, it would only mean more trouble in the long run, more of these pointless, posturing fights. Tom knew if he gave in to his desire to have it over and done with quickly, it would become a point of honour, and the rest of the soldiers would consider it their duty to grind the prisoner into the ground. That was the last think he needed, he had enough to worry about without taking gladiatorial events in to account. Ned’s voice interrupted his thoughts, calling out a frantic warning and Tom turned just in time to see the first solder, recovered from his close inspection of the wall, baring down on him with a chair levelled at his head. Tom has no time to avoid the blow, but raises his arm slightly to deflect it from his head to his right shoulder. The force sends him reeling backward, clutching at his arm. The first soldier stands, the chair now a splintered wreck in his hands, and glares at Ned. “You warned him.” His voice is filled with shock. Ned’s eyes widened in fear, and his mouth opens and closes a few times without any sound coming out. Ned backed away nervously, his hands rising in a pleading gesture. He makes a lunge for the boy, catching him by the collar, but Ned manages to twist away. He skids across the floor to stand beside Tom, his retreat only making the two soldiers angrier. With a deft flick of his wrist, the second soldier throws his knife and Ned closes his eyes, bracing himself for the pain of impact. The moments pass and the boy prises one eye open. Tom’s arm is stretched out in front of him, on a level with Ned’s throat. The knife is buried deep in his forearm, blood beginning to ooze from wound to drip on the floor. The room is silent, Ned’s horrified gaze transfers from the gruesome sight of the blade protruding from Tom’s arm, to Tom’s white face and icy expression. He coldly appraises the men before him, and the two soldiers expressions fill with horror and fear.